Ryutaro Umeno did most of the damage early, Randy Messenger did the heavy lifting late, and the Hanshin Tigers batterymates helped make sure their team’s fans were the ones still cheering after the final out. 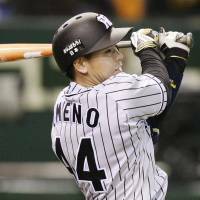 Umeno, the Tigers catcher, had an two-run double in the fourth and an RBI double in the eighth, while Messenger didn’t allow a baserunner from the sixth inning on as the Tigers beat the Yomiuri Giants 4-2 on Friday night in front of a crowd of 44,235 at Tokyo Dome. Messenger pitched his way into and out of trouble for 4 2/3 innings before bringing down the hammer over the rest of his outing. He allowed a run on an RBI groundout in the fifth then proceeded to retire the next 11 Giants in order. He pitched with a lead the entire way, but looked to be on the verge of losing it a few times early in the game. The Giants loaded the bases against him in the fourth, an inning during which he walked three batters, but the right-hander escaped after allowing just one run to score. He was in a pinch again in the fifth, but again got free with just one run allowed. “I needed to just take some breaths, try to relax, not get too amped up, just relax and make my pitches,” Messenger said. Messenger had the lead thanks in part to his catcher, Umeno, who connected on a double that fell inside the right-field foul line and just out of the reach of diving outfielder Yoshiyuki Kamei and brought in two runs in the fourth. “It was a tough pitch to hit and I wasn’t sure it would stay fair or if Kamei would catch it,” Umeno said. “Luckily it fell in and I got the two RBIs. Messenger (1-0) allowed a pair of runs on seven hits over eight innings. He struck out four and walked three. Oh Seung-hwan relieved Messenger in the ninth and finished off Yomiuri to convert the save. 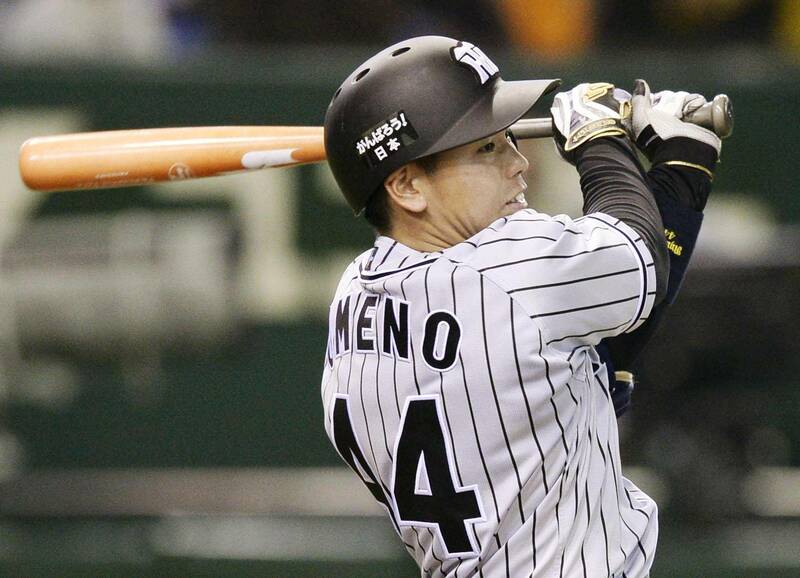 Umeno finished 2-for-3 with three RBIs, and Kosuke Fukudome drove in Hanshin’s other run. “We are playing well and will take it one game at a time throughout the season,” Umeno said. Umeno also had the best seat in the house as Messenger began rolling in the latter stages of the game. “I felt comfortable catching Messenger tonight and look forward to our next game as a battery,” he said. Tsuyoshi Nishioka continued his scorching start to the season by going 4-for-5 with a pair of doubles. Nishioka has hit safely in his last five games and has at least one hit in six of the Tigers’ seven games. The Kyojin fell for the fourth straight time, having just been swept by the Chunichi Dragons earlier in the week. “We had our chances but could not get the timely hit,” Yomiuri manager Tatsunori Hara said afterward. Shinnosuke Abe handled the catching duties for the first time this year because of Ryoji Aikawa’s injuries and Seiji Kobayashi’s struggles. The longtime Yomiuri backstop began the year at first base in a bid to preserve his health and was typically solid behind the plate and chipped in with a 2-for-4 night with his bat. Hirokazu Ibata had Yomiuri’s lone RBI. The Giants scored their other run when Shuichi Murata hit into a double play with the bases loaded. Starter Tomoyuki Sugano (1-1) lasted six innings, allowing three runs on seven hits with two strikeouts and a pair of walks. Fukudome got the Tigers on the board with an RBI double in the second, and Umeno’s double extended the lead to 3-0 in the fourth. The Giants pushed a run across in the bottom of the fourth and cut the lead to one after Hayato Sakamoto tripled to begin the fifth and came home on Ibata’s RBI groundout. Fukudome drew a one-out walk in the eighth, and Umeno tacked on an insurance run with another double. The Central League rivals will meet again on Saturday night at Tokyo Dome. Minoru Iwata (0-0) gets the start for Hanshin with Aaron Poreda (0-1) on the hill for Yomiuri. Nagoya —The Dragons’ Anderson Hernandez doubled in the winning run in the 10th inning off reliever Ryuji Ichioka (0-1) as Chunichi defeated Hiroshima 3-2 on Friday night in the Central League, handing the Carp their fourth straight loss. At Yokohama Stadium, Kazuhiro Hatakeyama hit a grand slam and Yasuhiro Ogawa (1-0) worked seven innings as Yakult shut out Yokohama, which saw its winning streak snapped at three. At Osaka’s Kyocera Dome, Naoyuki Uwasawa (1-0) went the distance and Jeremy Hermida kicked off a three-run seventh with a game-tying solo home run as Hokkaido Nippon Ham came from behind to beat Orix. At Seibu Prince Dome, reserve Fukuoka Softbank catcher Hiroaki Takaya’s three-run, eighth-inning double helped the Hawks rally past previously unbeaten Seibu. Eagles at Marines — ppd.